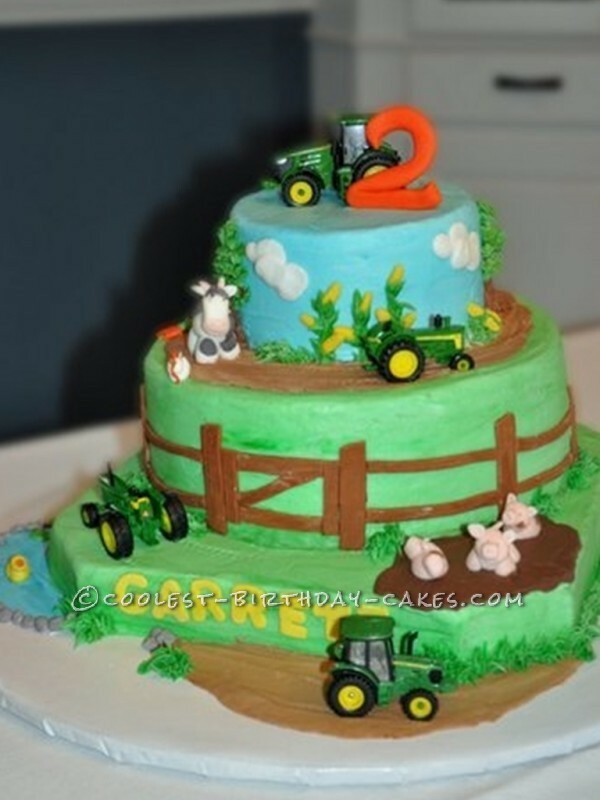 The Request: “Mom, for Garrett’s second birthday would you make a cake with farm animals and real tractors?” When my daughter plans a birthday party, her creative juices flow, and the party becomes an event with a theme. And this year, the farm with animals and tractors were to set the stage. How could I say anything but yes? Our research began, where else, on the web. 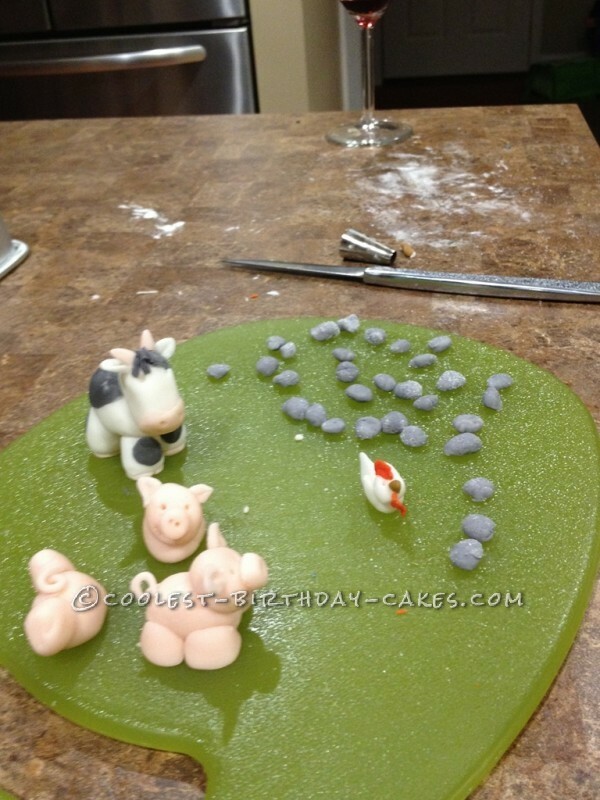 We simply searched fondant farm animals and found some very fun ideas. Now the plan…. The Plan: some pigs in mud, a cow on the side, a duck in a pond, corn, carrots and chickens. And of course.. real John Deere tractors. Now we needed a cake large enough for everything. No problem! Our family always loves a variety of cake so I decided on a stacked cake of chocolate and vanilla flavors. 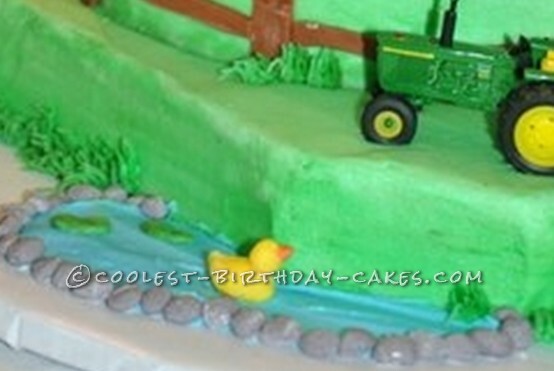 The sizes of the cakes needed to leave enough room to create the farm scenes. It is important to understand that even though I have a plan my cakes, often the results are a creative evolution. After stacking an array of cake pans in a number of different positions I decided to use a square for the base with two round cakes on top. Then the fun began- playing with fondant. I had collected a number of ideas from the internet. I find it very challenging to create from scratch. Visuals help me to get started and then my ideas more easily flow. Pink pigs, a black and white cow, gray stones (rolled in sugar for effect) and a chicken to start. I like to glue my fondant creations with a paste made of royal icing mix using a collection of children’s paint brushes that I keep with my supplies. I made the animals in the evenings after work (while enjoying a glass of wine) and tried different placement with the tractors on the cakes before I iced them. You will see in a later photo that I decided to cut off the points of the square cake. I thought it looked more interesting. The Process: Even though I love creating ‘flowers and things’ with fondant, our family prefers my yummy icing on the cake. But I do like the smooth look. To do this I add half a cup meringue powder to my basic butter cream recipe. After the cake is iced and has a bit of time to set up nicely, I pat it with a cotton cloth. With Garrett’s cake, I had each cake on cardboard so they could be iced and smoothed before setting them on top of one another. Once they were stacked I began to add background to the sides. The fencing was made of thin fondant strips that I slashed with a knife for texture. 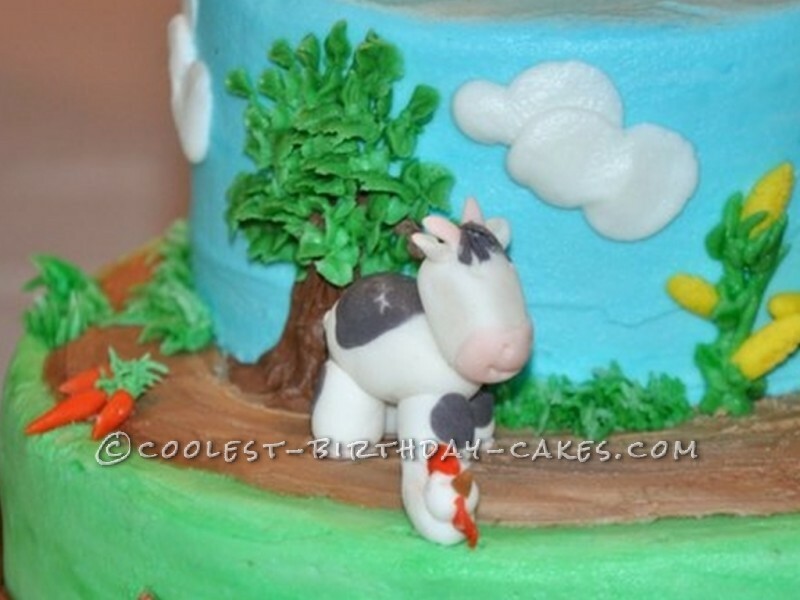 Most of the other side decorations, (trees, clouds, grass), were piped with butter cream. The tractors needed some dirt made of mocha icing. The pigs were in chocolate mud. The pond needed a duck. The corn stalks and the carrots were a result of the creative evolution. The Response: When I arrived at my daughter’s home with the cake, Garrett came running to my car saying “Cake, Grammy, cake”. When I opened the car door and he saw this creation, his eyes got really big and he first said “Oink”. A few seconds later “Moo”. His reaction made my day. Plus, the cake was a hit with everyone and blended perfectly with the party theme. In case you are wondering about the finger in the side of the cake. This photo was not staged and Garrett did not break the fence with his finger. I did not have enough fondant to make a single strip so I made it from small pieced to create the broken fence look. My family thinks this was my ‘best cake ever’; I hope you like it too. 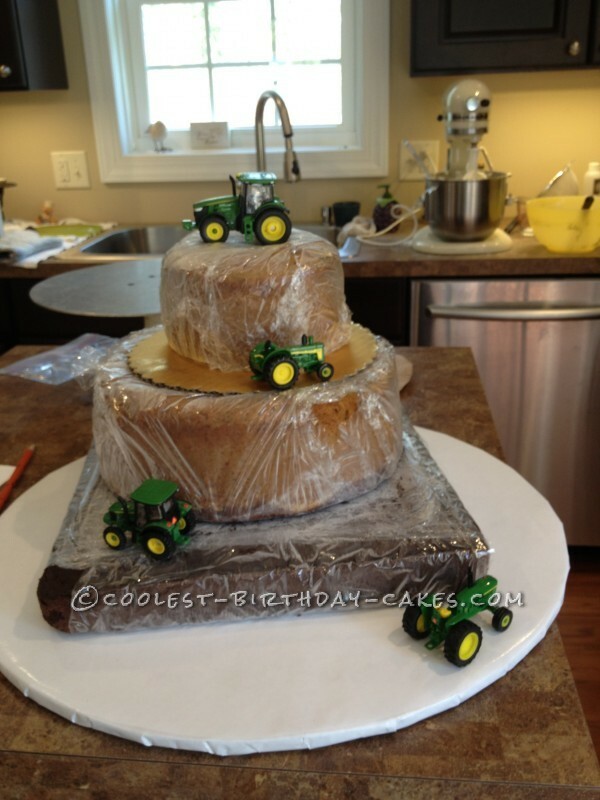 Birthday cake idea Posted by Kathy D.
Such a great cake! You are so talented. A really cool cake! Yeah Cathy!